Northeast Cruise Guide: Norwegian Cruise Line Ships to Get Emission Scrubbers. Norwegian Cruise Line Ships to Get Emission Scrubbers. Norwegian Cruise Line announced that a significant investment will be made in reducing their ships emissions with the installation of 28 scrubbers on six ships in the line’s fleet. 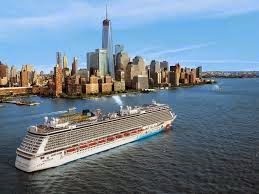 The company has contracted with Green Tech Marine for the outfitting of the scrubbers on Norwegian Breakaway, Norwegian Dawn, Norwegian Jewel, Norwegian Gem, Norwegian Pearl and Norwegian Sun. The scrubbers will be installed starting this spring and installation will continue through 2016. Green Tech Marine also supplied the scrubbers on the line’s Hawaii-based Pride of America last year and will deliver 10 scrubbers to the company’s two new builds, Norwegian Escape and Norwegian Bliss, being constructed in Germany. The Norwegian Gem and Norwegian Breakaway sail from New York to Bermuda, Florida / Bahamas, Caribbean and New England/Canada year-round. The Norwegian Dawn sails seasonally from Boston to Bermuda and New England/Canada.